Last winter I attended a Hobby Show on behalf of the Halifax RC Park. While I was there I couldn’t help but notice the Model Railway set ups, they immediately took me back to my childhood, almost as much as RC. On the advice of a few of the experts, I bought a small Presidents Choice Train set, just to see if I really enjoyed it. Well. The results are in and I truly enjoy it. 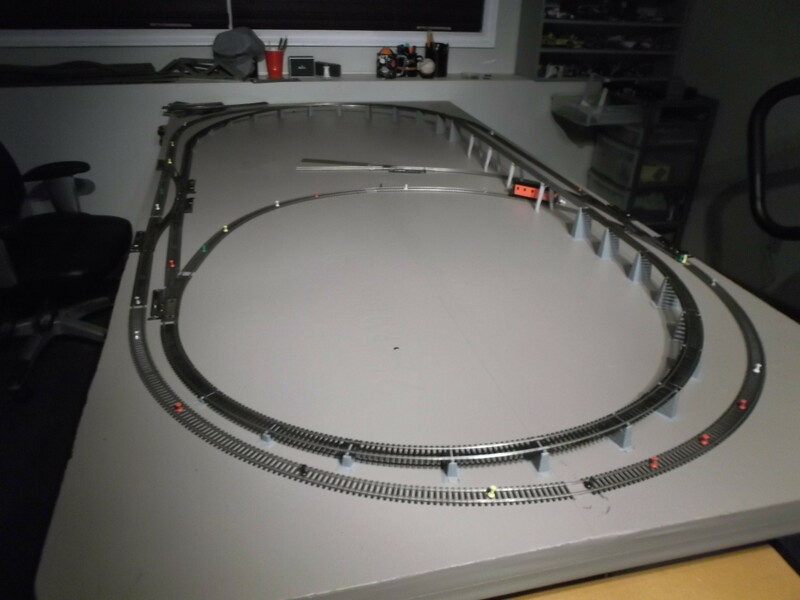 As winter approaches my RC ‘s have been maintained, cleaned and put away for the better part of 2 weeks and I am getting antsy, so I decided this winter to build a 4×8 Ho Scale Model railway layout. I am truly learning this from scratch and by no means an expert. Throughout the coming months, I will post pictures of my build here on this page, share my triumphs and defeats as I tackle this project. 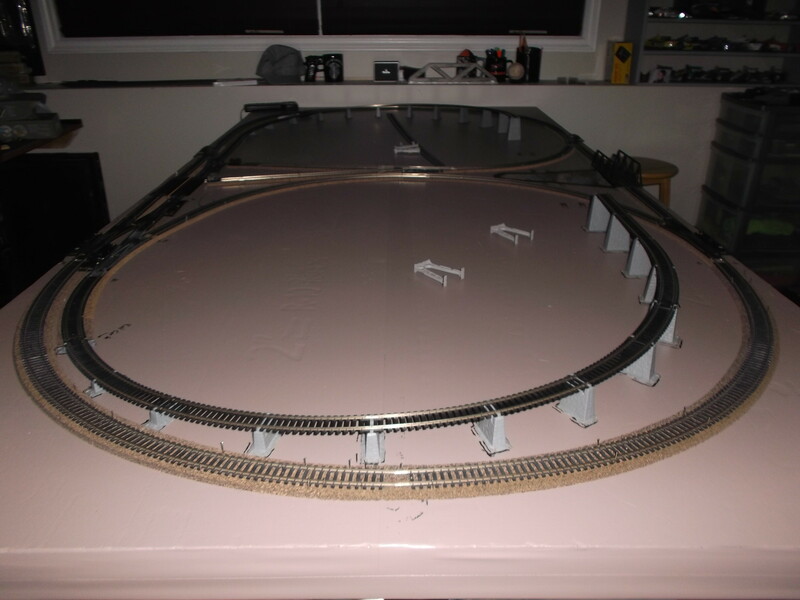 I will still post RC stuff from time to time and will get back into the RC scene once the snow is gone, but for now, I will be building a Model Railway. Since the last video, the factory/warehouse has been relocated to the top of the yard. A church has been added as well as a another house. All of the lighting is now complete. We do have plans to change out the street lights to a different style. These were shot at night with low light in attempt to show the Park and Street Lights. Stacey got her park lit up. She was nervous at first, because she had never done anything electrical, but soon settled in like a “Boss” and wired it up. 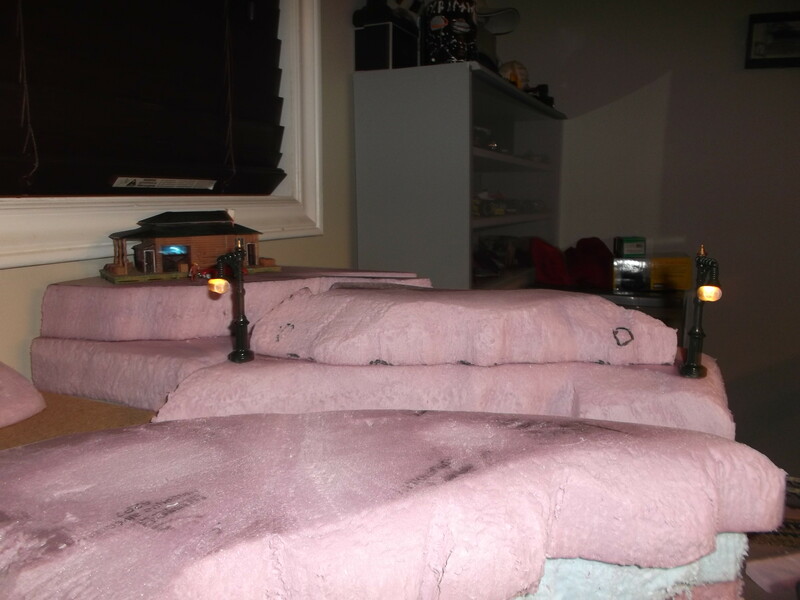 I got the street lights in place and wired. I really like the look they add to the layout. Stacey begins work on her subdivision…. I remember when this was just my hobby. “X” marks the spot where she will run the wires for the lights for her houses. She has made solid progress. The Drive In is in place, I just need to put down some ground cover. Ground cover in place. I will be wiring in the projector light next. Stacey is getting ready to tackle the park. The fence is up and people are in place, Trees and bushes are next. I will be putting the water in place soon. You can also see the streets have been lined. 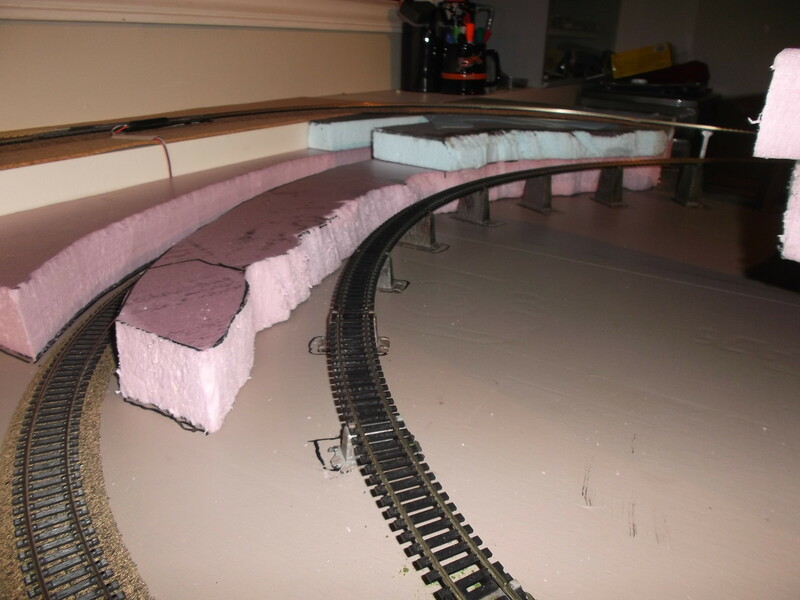 The ballast is finished for now. The parking lot for the park is also in place. A better shot of the park and the new house. This is the old park location and the future home of a church. I put in a elevation so the church will be on a hill. Just an overview of the current situation. I got plans for this spot. Putting down a base ground colour. Walthers Skyview Drive-In. This should go nicely in that spot. It is starting to come together. I still need to put down some gravel and the speakers for the cars. The DQ & the Gas station are in place. The curbs are made from a piece of railway and painted grey to look like concrete curbs. Another angle of the DQ & gas station. 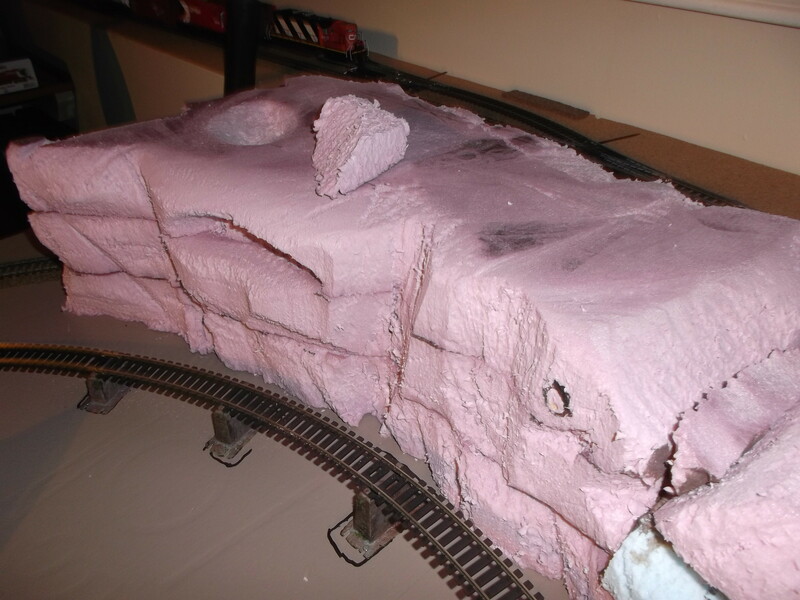 I went with a rock wall facing the train tracks. These are the areas currently under construction. My wife is currently building another house that will be placed in the middle. This is the old park location. I decided to elevate the area and this maybe the location of a church. 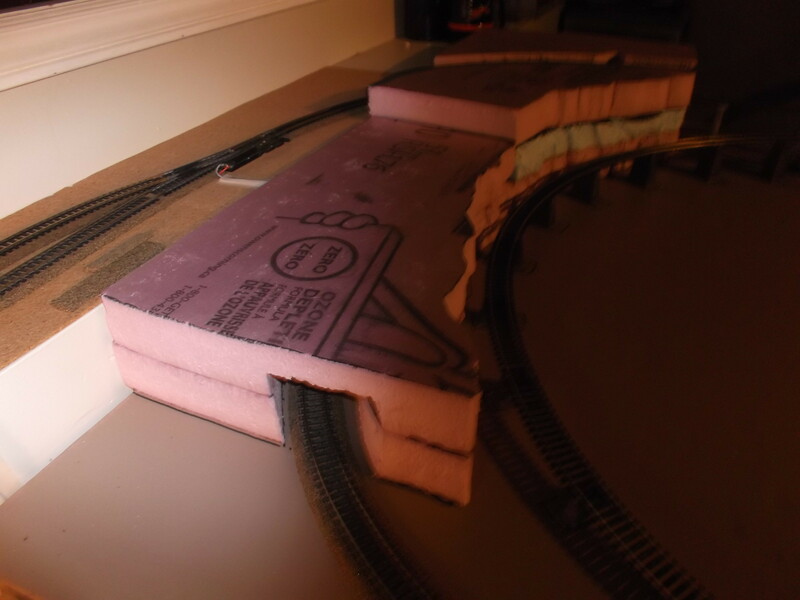 I started to ballast the track. This was hard on the nerves. I will wait until it dries, try it out and if everything is good, I will finish the track. You can also see the backside of the DQ and gas station. 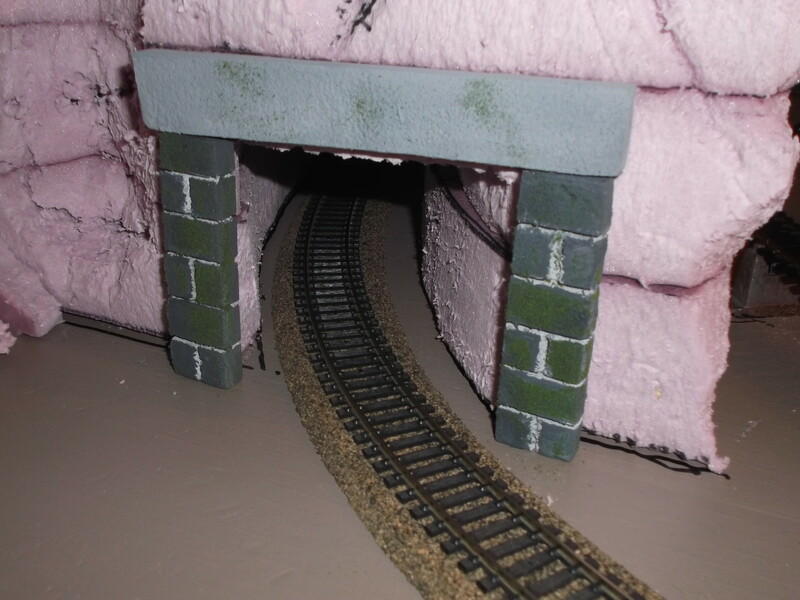 Ballast on the track as it heads into the tunnel. 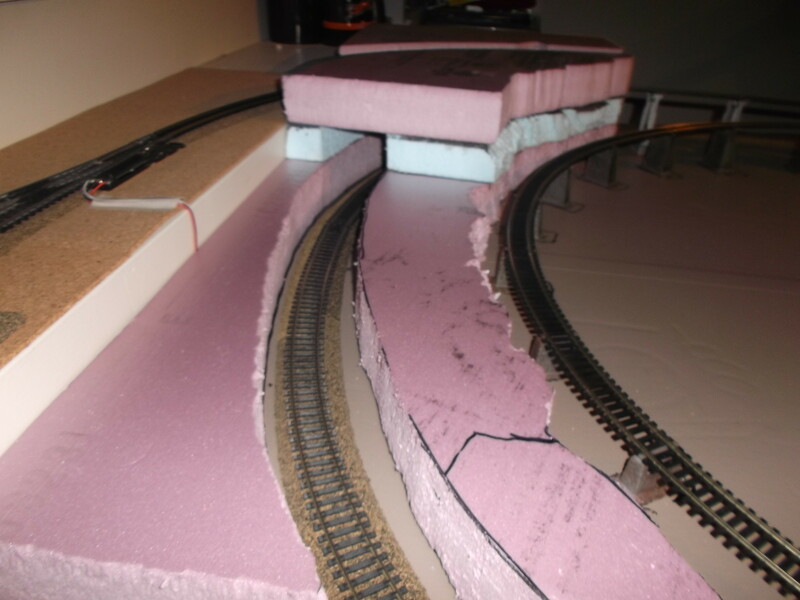 This is an FPV of the layout in its current state. There are more changes on the way. Just when you think your happy, you blow things up and start again. I am really enjoying this hobby. So I moved the factory from beside the tunnel to the end of the table. 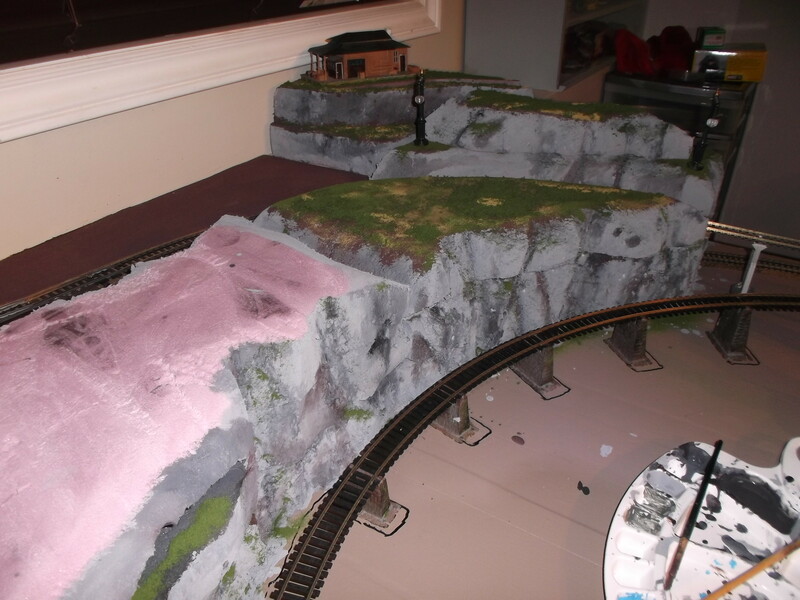 The hill and the garage I had at this location have been removed from the layout at this time. At the end of the layout beside the tunnel, where the factory used to be, will be a Drive-In Theatre, a Dairy Queen and a gas station. The brown square at the right of the picture is looking like it will be the third location for the park. Yep the park is moving agian. This is my fleet of locomotives. 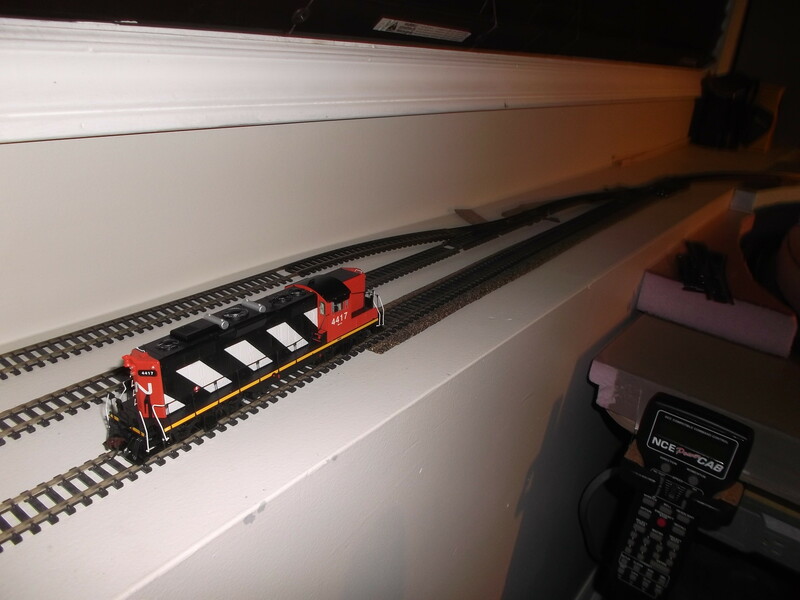 The Diesel CN and CP are both Athearn Genesis GP9 w/DCC and Sound. The Steam Locomotive which is also a CN, was part of the first train set I bought last spring. It is a Mehano 2-6-0 Mogol Steam Engine with attached Tender. It is based on locomotives widely built in the USA from the early 1860s to the 1920s. My wife had a Digitrax Sound and Function Decoder added to the Steamer as a Christmas present. 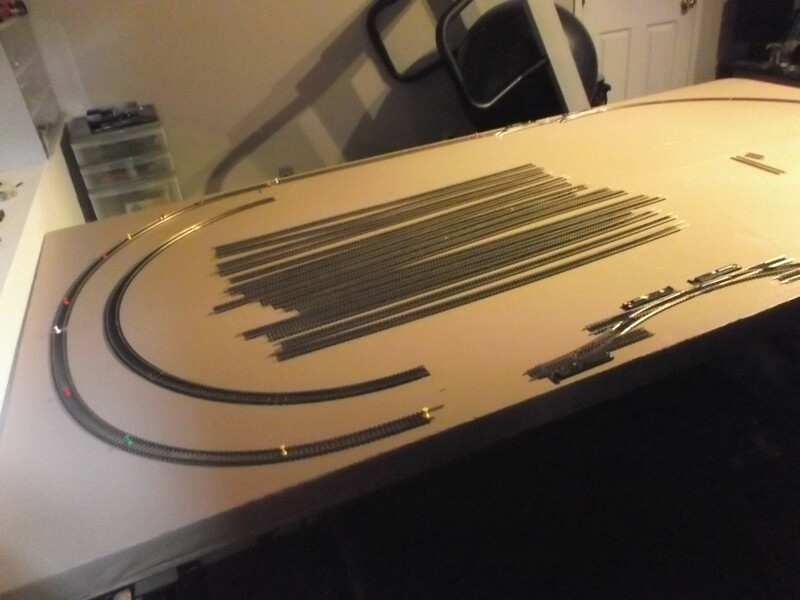 This will allow me to run my first train on my new layout. The residential section is coming together. That is an empty lot next to the gray house. Know anyone looking to build? It is tough to see, but the houses are built on a small hill. The water section still requires some work. The park is almost finished, with the exception of the parking lot and the addition of a little more vegetation. This will be a small residential section made up of three houses. The road will end at a memorial park being built by my wife. A different angle shows the same thing, but it gives you a better look at the size of the water way. Which still happens to be pink. A quick cellphone video of the work in progress. The blue water is not permanent, I just put it down to help me visualize. It is almost time to start to ballast. I got the roads cleaned up. They went together much like the car models I use to do as a kid. Thought I would take a break from working on the Train. I decided a couple of houses would be a nice distraction. Some road painting and crack fill. I think the color is too light, I will need to redo them. The roads are starting to take shape. The cork in front of the 7/11 will be a road. The 7/11 was bought second hand. I bought this piece second hand. I was really happy with the weathering the previous owner did to it. A wider shot of the ground cover. Putting down some ground cover. A wider shot of the painting in progress. Starting to paint. Here is one of the tunnel entrances. I got the lights in the lamp posts and house all wired up. 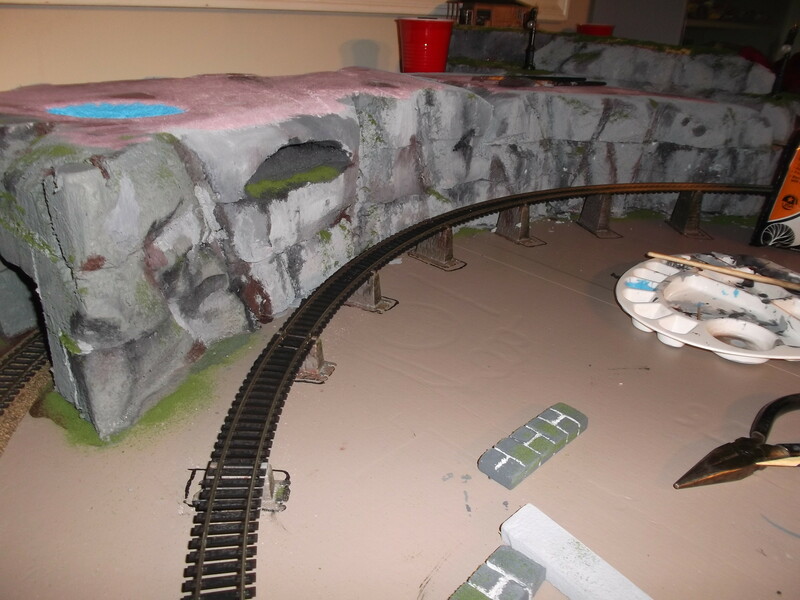 While working on the tunnel, I am running my trains around the track, making sure I have a smooth operation. 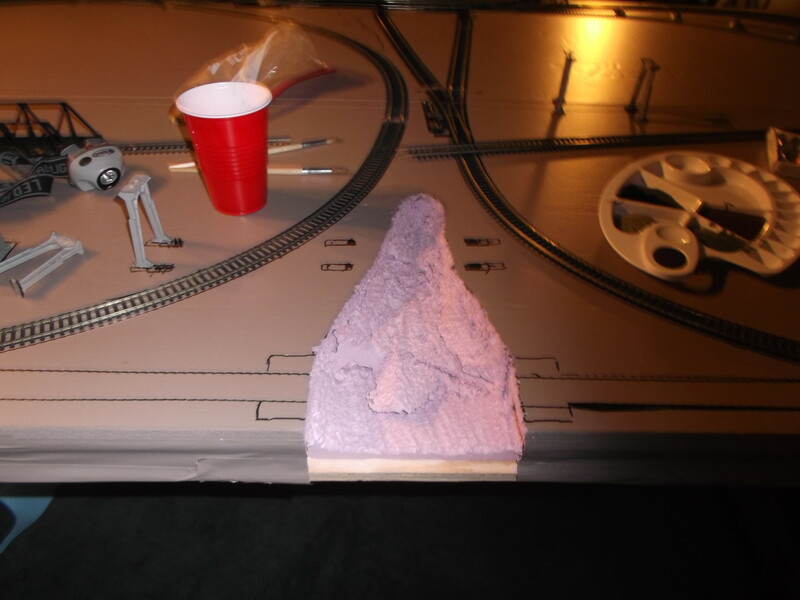 As of this morning, after many track adjustments my Locomotives are running smooth, but I have had to make some modifications to some rolling stock, in order to keep them rolling. 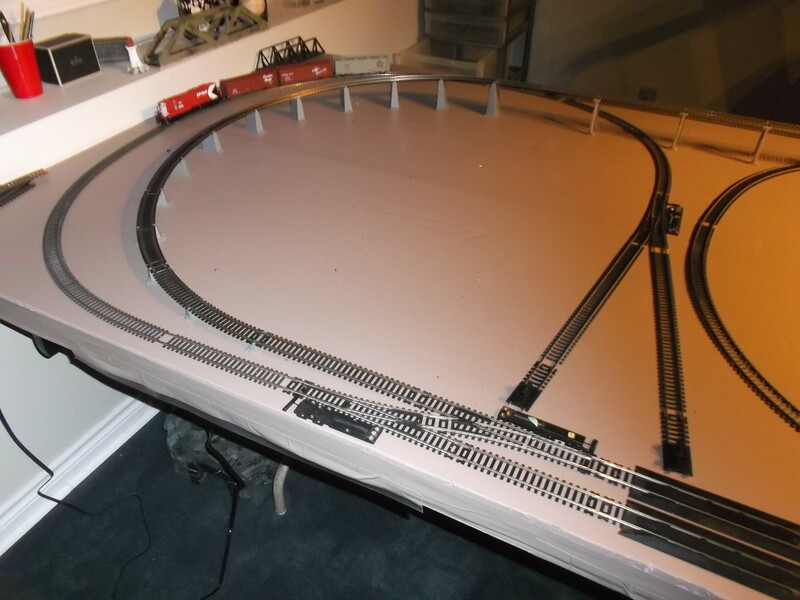 All turnouts are functioning great, but I do have a little track work to do in the yard where I am experiencing some connectivity issues. I am starting to see it come to life. I used a sanding block to round out the edges. 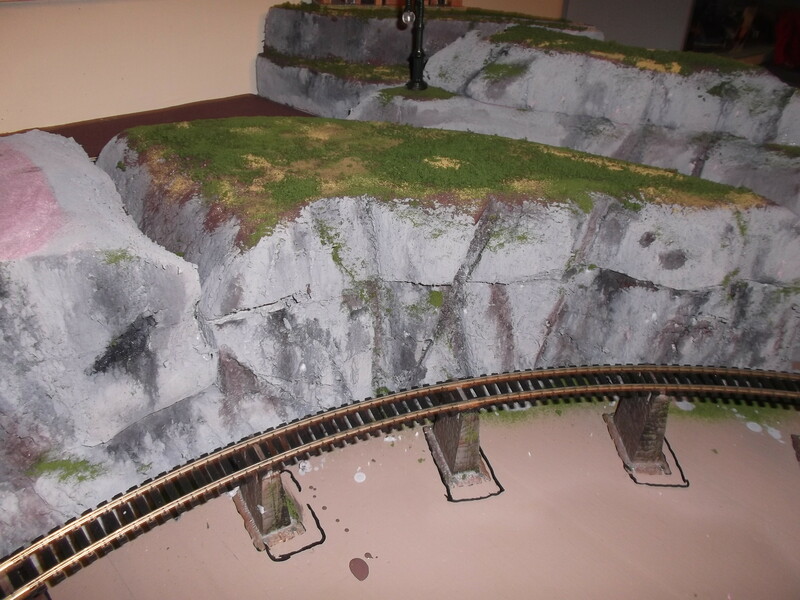 It is time to start sculpting and making it more like a landscaped tunnel/mountain instead of a pile of rigid board. Some will be glued in place and others will beheld together with tooth picks. This will allow me access to the tunnel should I need it. I just hollow it out where I need it and stack them on each other. 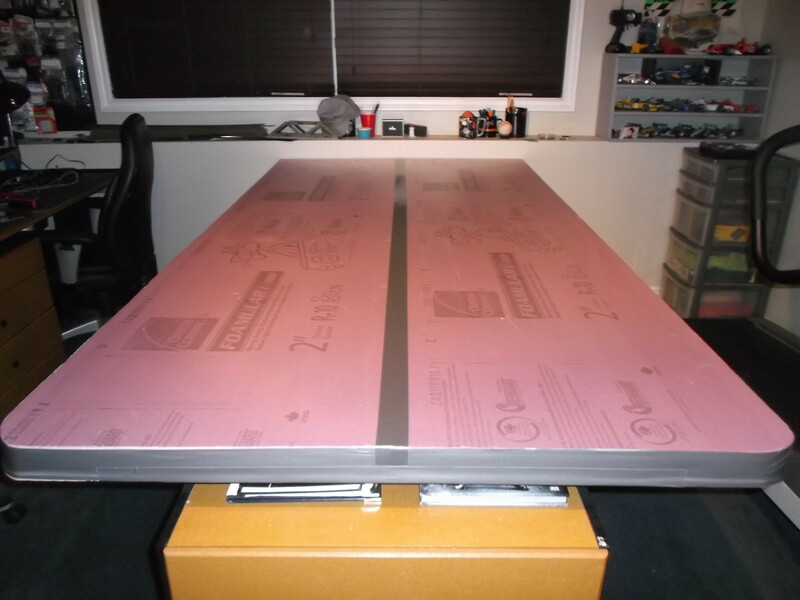 I am going to use the rigid insulation to make my tunnel. This change will bring the track over what will eventually be a tunnel. 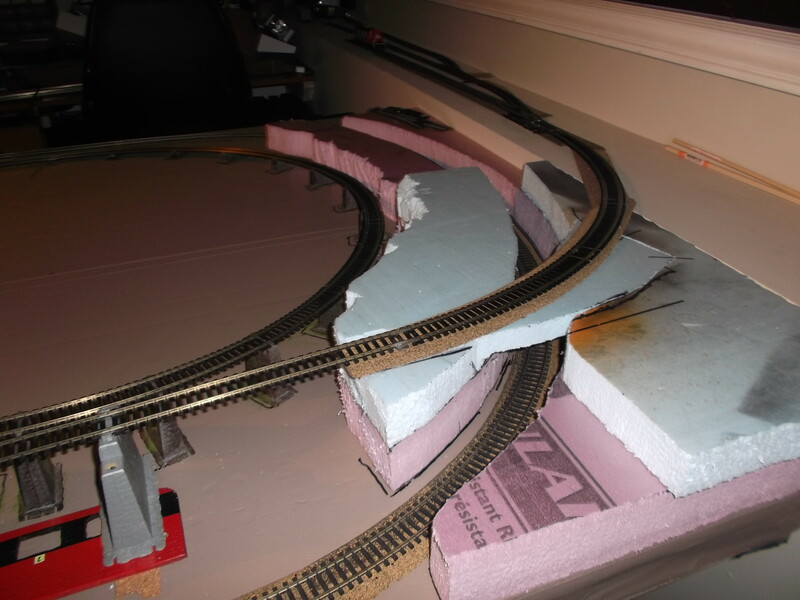 I wanted a better functioning rail Yard which meant using the ledge under a window. 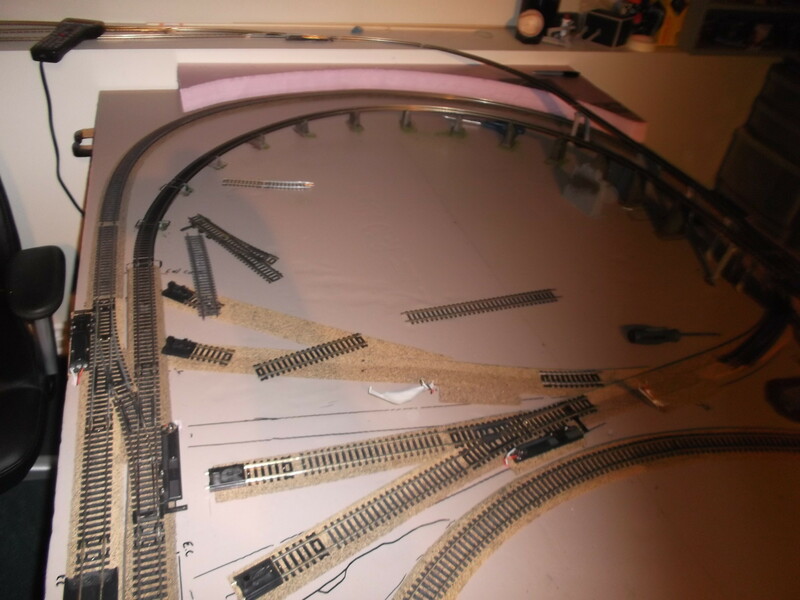 After running my trains for a week and making sure my layout worked, which it did. I decided to change it in order to add more function and leave more room for scenery. The inside Rail Yard has got to go. 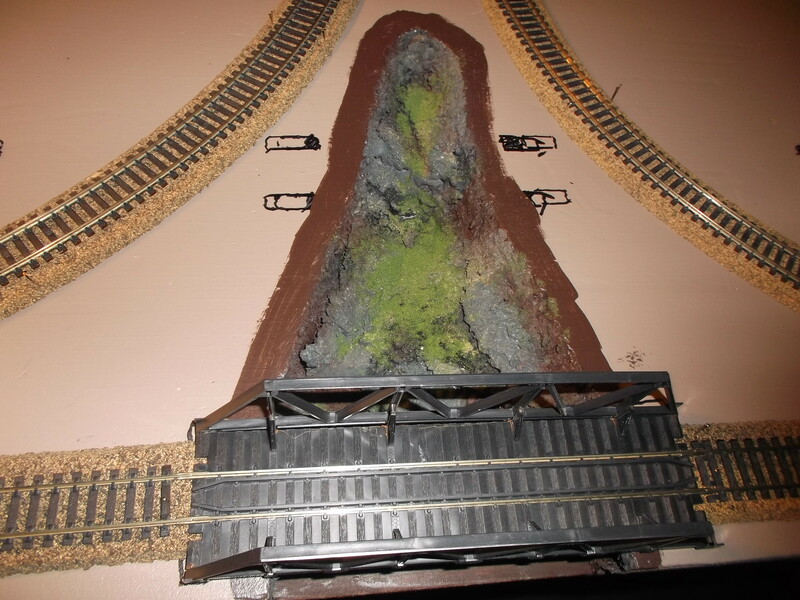 I put down a cork rail bed. I like the look of the raised track. 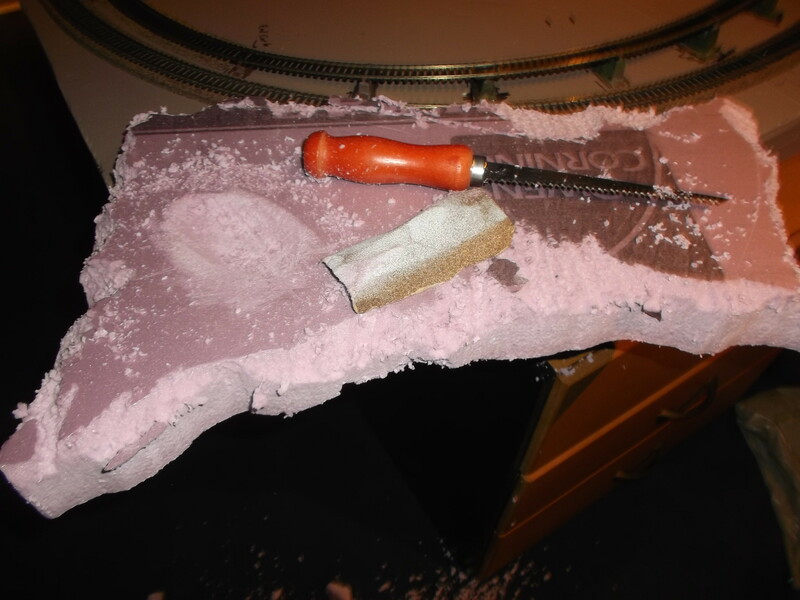 Cutting out a “Gulley”, I just want a reason to put in a bridge. Testing the layout, making sure everything works. This is the layout. It features 2 connecting ovals, with a connected small inner loop. 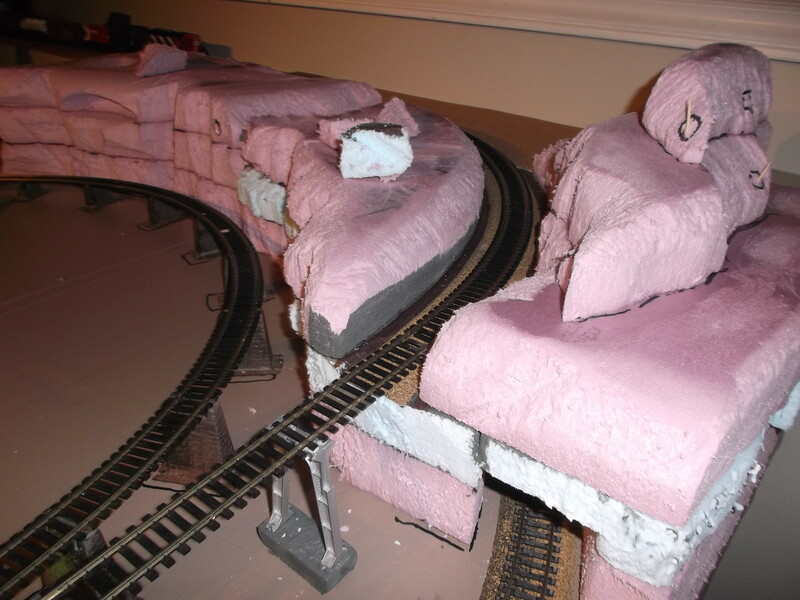 It also includes elevation changes, a over-under, a rail bridge and a rail yard. 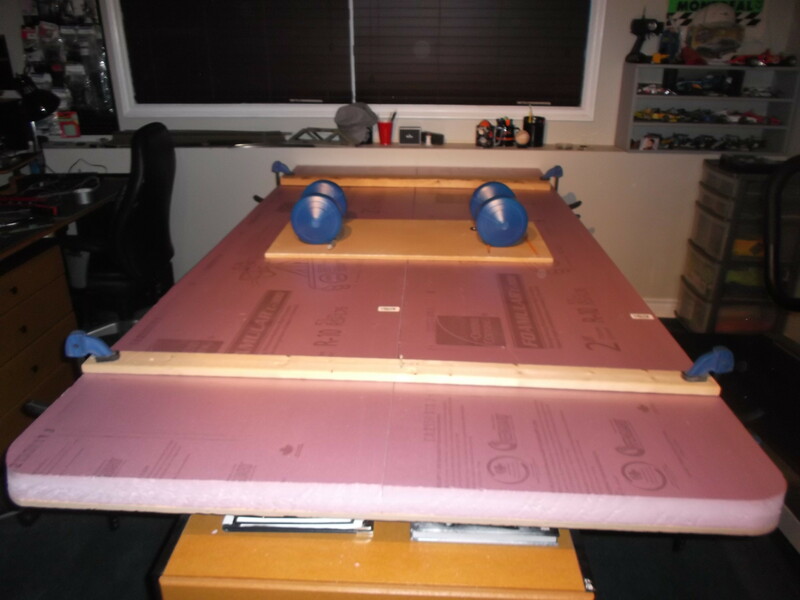 Gluing done some 2″ rigid insulation. 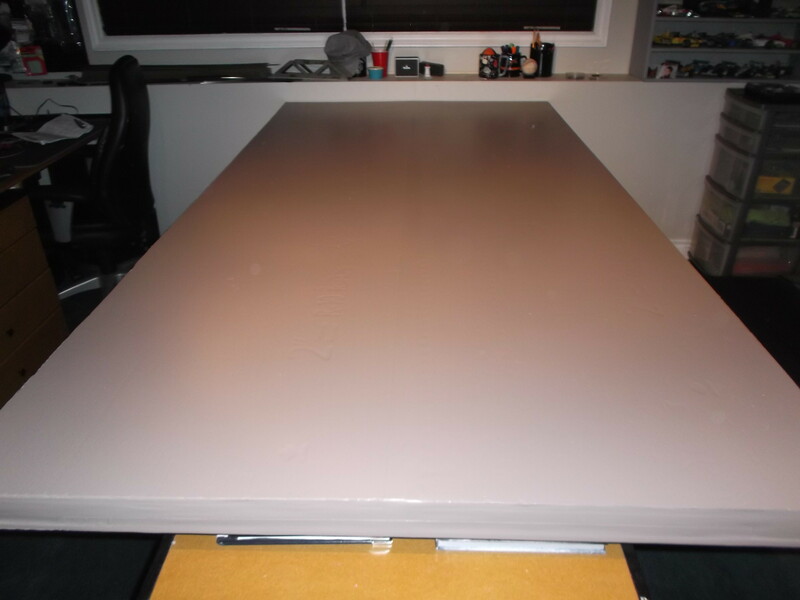 A blank slate. 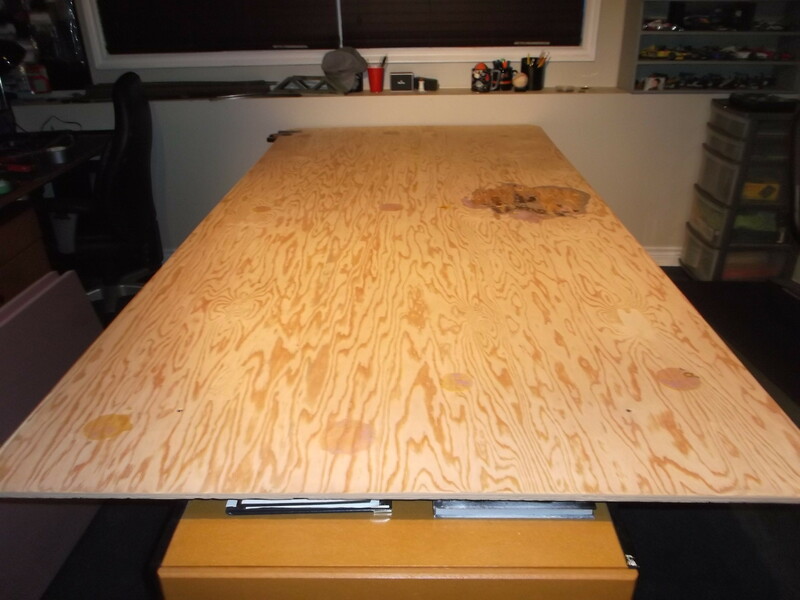 A 4×8 sheet of plywood on a table top.